Containing concert staples and fan favourites such as Sister Awake, The Bazaar, Fire In The Head and Correspondences, the album was a full realisation of the band’s fusion of eastern instrumentation meeting full-on rock and roll. 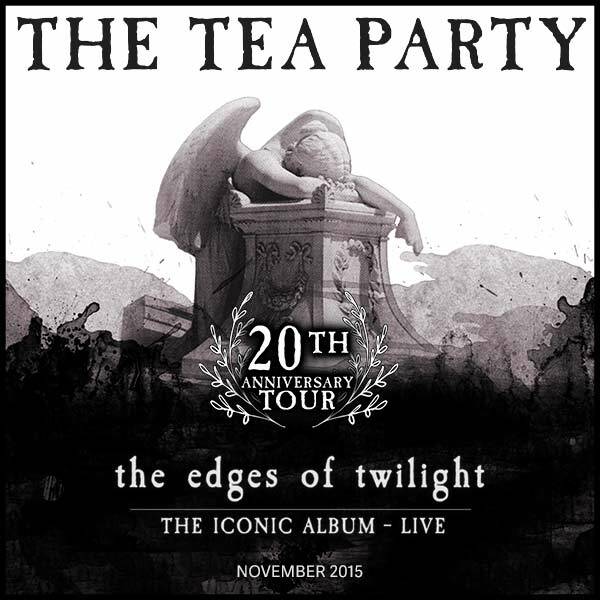 For the first time in Australia, The Tea Party are going to perform the iconic album in its entirety and follow an interval with a second set of hits taken from their first album, Splendor Solis, through to last year’s comeback album The Ocean At The End. This will be The Tea Party’s 15th tour of Australia. The Edges of Twilight, originally released on March 28, 1995, hit double platinum and was nominated for two Junos in their Native Canada. Perhaps still the most diverse album the band have released, it contains beautiful instrumentals such as The Badger, peaceful acoustic numbers like Shadows on The Mountainside, featuring everything from sitar to hurdy-gurdy, through to the relentless onslaught of rock tracks like Coming Home. The band will release both a deluxe edition CD of the album and a 2LP 180 gram heavyweight vinyl edition of the original release. The 2-CD deluxe, digital deluxe & vinyl editions will feature newly remastered audio. Deluxe editions will also include a bonus disc consisting of alternate, live, radio sessions and bonus audio, and a booklet featuring the story of the album with new band interviews and previously unseen photos. The three founding members of the band, Jeff Martin, Jeff Burrows and Stuart Chatwood are looking forward to sharing this album with their fans again. Front man Martin says; “People often ask me ‘what does The Edges of Twilight mean to me as a musician?’ My answer, although not so simple, is simply this: it was the crystallization and the manifestation of an incredible musical vision between the three of us, and the fact that it was achieved in such a way was probably, and is still, one of the proudest musical achievements of my life.